Our PROTECT product is a specially formulated, commercial grade, non-yellowing satin polyacrylic. It has a low matte sheen finish, which is a slightly higher sheen than COLOUR. Use our commercial grade, non-yellowing polyurethane for extra protection from life's bumps and bruises. PROTECT adds a layer of protection between the paint surface and the world. How do I apply PROTECT? PROTECT can be applied with a brush or a roller. You can use the same Reviver brush used for COLOUR. If applying with a roller, roll slowly, as rolling can cause bubbles. Because the finish of PROTECT has a slightly higher sheen than COLOUR, apply in straight lines as best as possible. Kellie's Tips: Be sure to apply in a generous amounts, as applying sparingly can cause streaking. If I am poly-ing a dark piece, I like to tint the poly with the paint. 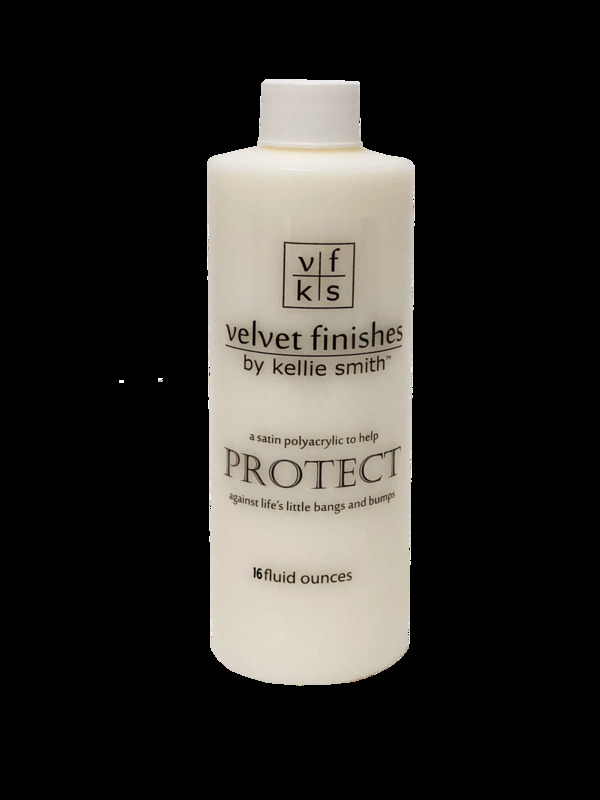 Because of the slightly higher sheen of Protect, it can show streaking if not applied carefully. There's no real formula for doing this I just add COLOUR to PROTECT so that streaks are a non issue. Applying the PROTECT doesn't have to be done quite so carefully if tinted. You can also apply PROTECT and apply COLOUR as your final coat. That provides the protection, without the additional sheen, which some prefer. Is it necessary to use PROTECT? We feel PROTECT is a must if you have a high traffic piece – like a dining table, the tops of a nightstand, a bookcase shelf. Otherwise, COLOUR dries to a nice, hard surface. However, we are in the habit of using either Protect or the Enhance Glaze on all the pieces we do as a matter of practice. If you feel you need extra-extra protection for your piece, simply apply additional coats. You do not have to sand in-between coats like most poly’s, just let it dry and apply again.